This week's 5.2.2 patch was what I'd generally consider a relatively minor patch, mostly adding some tweaks and bug fixes, but for what it is it has generated a surprising amount of community buzz. 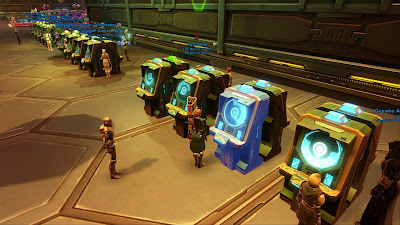 First off, the Nar Shaddaa Nightlife event is making a return. I actually had to go back into my own blog archives to refresh my memory about this event: It was introduced in 2014, at which point I wrote a single blog post about it. It returned in summer 2015, unchanged, so I did not even find it worth a mention at the time. Last year it didn't make a reappearance but we got the Dark vs. Light event instead. With three years having gone past since I last paid any attention to it, it almost feels fresh again - though they did in fact also make some updates this time around, for example by adding a daily mission to use the slot machines ten times and a little quest to find a cheating patron in the casino. Re-reading that post from 2014 I was kind of amused by just how similar my experience back then was to what I'm once again experiencing right now. People around me bragging about how many hundreds of thousands millions of credits they've already blown on the slot machines in a single day? Check. Me just feeling totally bewildered by the whole thing? Also check. In fairness, some of the new rewards Bioware has introduced are pretty cool - but not to the point that I'd waste my time on mindlessly clicking slots for god knows how long. Whatever other vices I may have, an urge to gamble is clearly something I'll never have to worry about. Where Bioware did get me a bit are the freebies. When the event was first introduced, I did the intro quest that awarded free chips on all of my alts to not let any goodies go to waste. This time around, Bioware has decided to entice people into playing by adding casino chips as drops to flashpoint and operation bosses, logic be damned. This saw me finishing Tuesday's op with about thirty smuggler's luck chips in my bag, which I grudgingly clicked my way through just so they would be put to use. If these continue to drop from everything for the next two months, it's going to be a long summer. In other news, the patch added the ability to dress Theron Shan and Shae Vizla in custom outfits. This has pretty much zero relevance to me as I was never hugely into customising my companions (I think in my over five years of blogging about SWTOR, I made a whole two posts about it) and I'm even less bothered now that every "Outlander" has a whole legion of them - if anything I was slightly annoyed that this change caused my inventory to be filled with some unvendorable junk items, as both companions' looks were "reset". My Twitter feed however has been going absolutely nuts about this. If I'd ever needed proof that there are a lot of people out there that play the game in a very different manner to me, that would have done it. #SWTORFamily member @TheTheronShan even held a little contest to find the best-dressed version of himself after the patch. I don't get you guys, but rock on. All that said, there was a small change that made a big difference for me too: That crew skill missions now grant companion influence. As happy as I was when they increased stack sizes to 9,999, I never came close to actually hitting that limit for any crafting materials because I'm too lazy to keep running missions once my immediate needs have been satisfied. But now, everything's changed! In between boss attempts or warzones I'm now making a point of sending all of my lowest-influence companions out on random missions, and I enjoy watching them slowly leap-frog each other up the ranks. For many of the KotET companions, this was actually the first time I've even heard their various crafting voice lines. Why would I have sent rank 1 Shae Vizla out on any mission when I could have rank 50 M1-4X do it instead? Well, now I have a reason. I wanted the Gamorrean, myself, in a way that I didn't want any of the other prizes. Except for the Kingpin's Blaster Rifle (a tommygun looking number), but I got one of those the last time this came 'round. I scored a contract last night after a cumulative 700k in credits spent while I was plotzing around in GoH, so that's done and dusted. Really, the only thing keeping me tied to the event this time around are those Decorations, namely the lights. I don't give much of a toss about the Gamorrean and Vectron now that I own them, although of course multiples are nice to have just in case they break the Achievements again. Multiples of the Mic Stand and Gambler's Bar are frankly unnecessary for me whilst that Party Floor is rather costly for many multiples (and also annoyingly difficult to work with since it's a 'Carpet' hook), but with the Lights only costing 1 GC apiece they're very cheap and very easy to get ahold of, and quite decent-looking to boot. I'm broke as a very broke thing and can't be bothered to flashpoint (unless you can get the coin via story/solo FPs?) So unless I can sell my Corrupted Command Flair (Cr45Mil on JC's GTN, and WTF are the seller's smoking, and for that matter, WTF are any buyers smoking? ), and even then I' got other things I want more. Corrupted Command Flair's going for something similar over on TRE at the moment. There are three up there, going for 40, 50, and 60 million respectively, so at least the apparent 'demand' is shared across multiple servers. Still rather ridiculous, of course. This is the first time I've been in town for this event and omg... it is the most boring thing ever. I spent an hour kicking the machines to cough up enough tickets for 2 legacy bound lightsabers. I never plan to do it again. Means to an end for me. What i really like about this event is the fact that all players -and i really mean all players- participate. We have the ops folks, the pvp'ers, the gtn-players and the rp'ers...and all come together at one place. The pvp'ers normally stand around at their section of the fleet or at their strongholds. The rp'ers have their secret locations. But now...all take short brakes ans visit Nar Shaddaa. The other events are recurring..."i don't participate this time. next time, in 4 weeks, suits me better". But who wants to wait another 2 years? It remembers me about the time, when the whole community gathered on Hoth to get a Tauntaun. It is a sign of life...the game is still here...the players are here. Everything is fine.